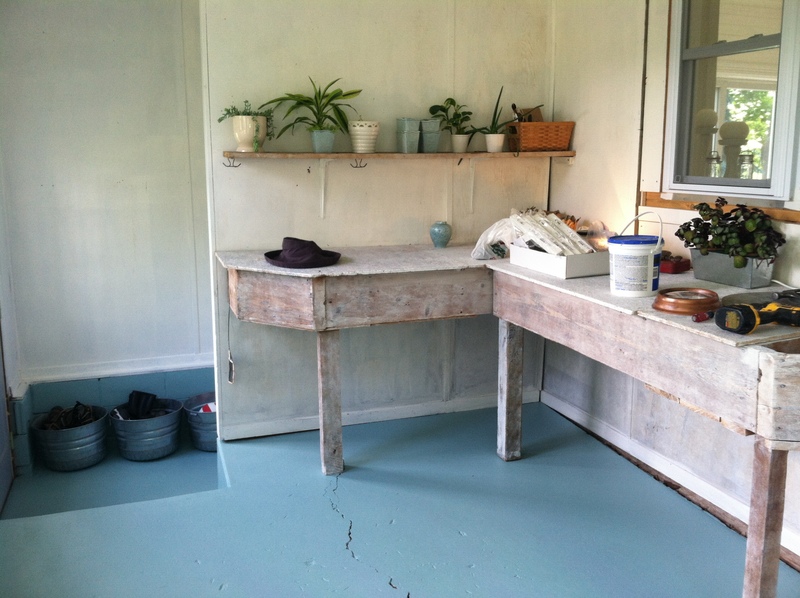 Making Do Farm Porch – RENOVATION COMPLETE! 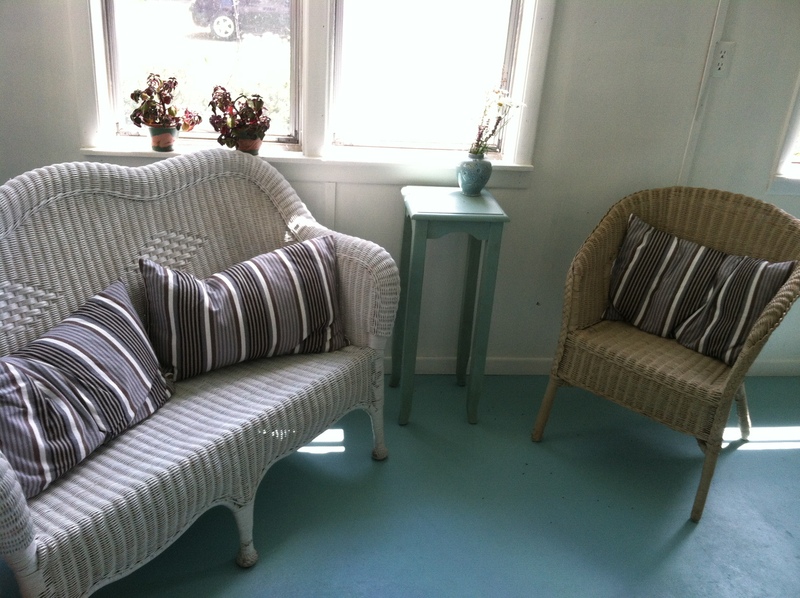 It’s time to introduce you all to the newly renovated farm porch! It’s been done for a while now, but it never dawned on me to update this post! So, here you have it. 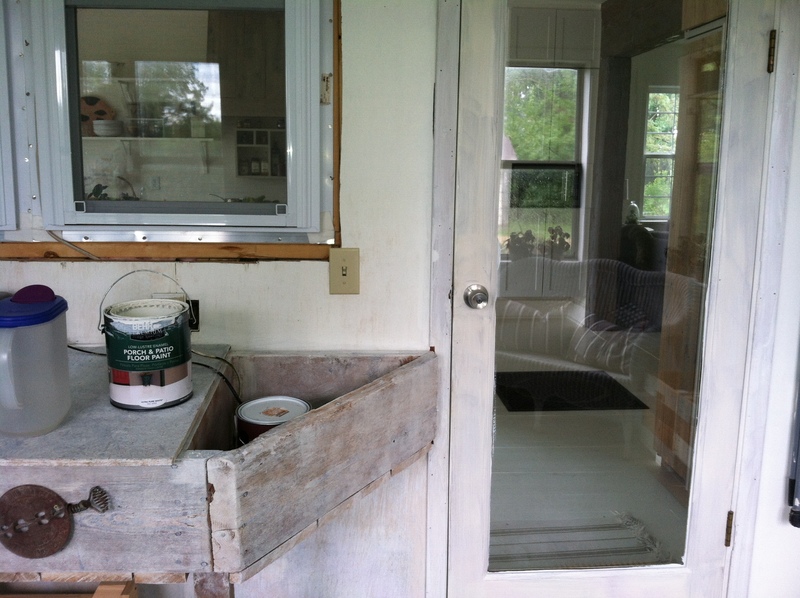 Now the porch has all new windows, built-in storage for wood and seed starting materials, a big coat closet, cute entry with galvanized shoe bins and a cabinet for spring potting or crafts. The rack you see in this picture is what I use for my seed trays in the spring. Little seed babies love the southern exposure and warmth of this room, so it functions as a quasi greenhouse of sorts. Jeff did the build out in March, but I didn’t get the painting done until a few weeks ago! 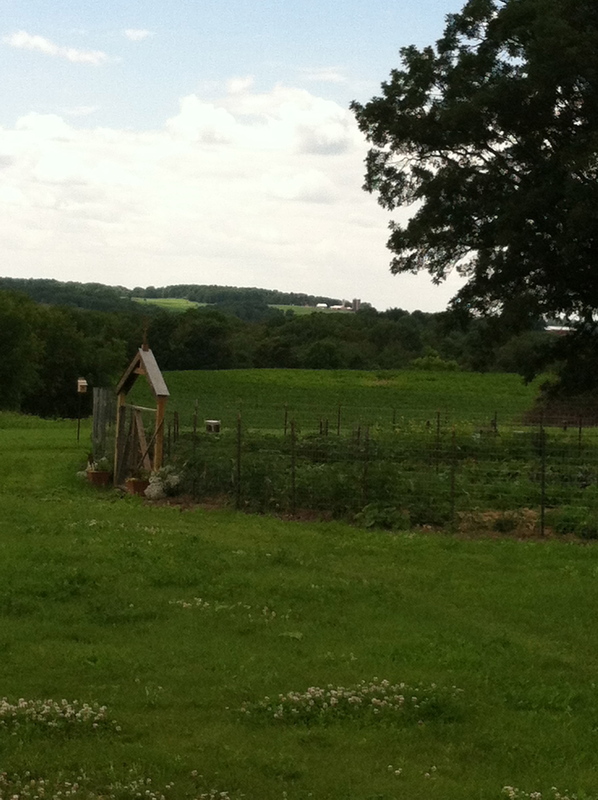 It has been a very lazy summer at the farm for me – shhhh, don’t tell Jeff that! New porch closet for coats and big storage shelves for seeds and stuff. The lids of these bench seats are on hinges so they lift up and provide all the space inside the bins for wood, kindling, paper, potting soil, bird seed for the feeders, my seed trays when not in use and other potting materials. I love how I can have all that junk, but nobody can see it! NO VISUAL NOISE! Shoes are easy-off as you walk in from the gardens, and if you need to lace-up, there’s a nice bench to rest your bum! We also added that western-facing window, so now we can see out over the lawn and gardens and far-off hills – a beautiful view, for sure. Here’s where the mess can happen come Spring – seed trays can be filled and plants potted on this easy-to-clean potting bench. The cabinet holds my canning equipment and the drawers have some house tools, the mouse traps and other miscellaneous craft or “junk drawer” stuff – so handy – and again, lots of junk NO VISUAL NOISE! Remember my TEMPORARY fix back in 2014? That was better, but SO much better now! Thank you, dear husband! Scroll even further down to remember what it looked like when we bought the place in 2013. It’s come a long way! Temporary Makeover July 2014 – Ahh! Much Better. Our farmhouse porch faces south with a full wall of old broken windows. It is our hope to someday add floor-to-ceiling windows and create a solarium space for seed starting, potting and other plant related projects, but until that project queues up, I figure I need to be able to live with what we have. I’m not one to have patience for dirt and grime, so in a fit of mid-day frenzy induced by rain, I decided to paint the porch. My main goal – brighten and clean. 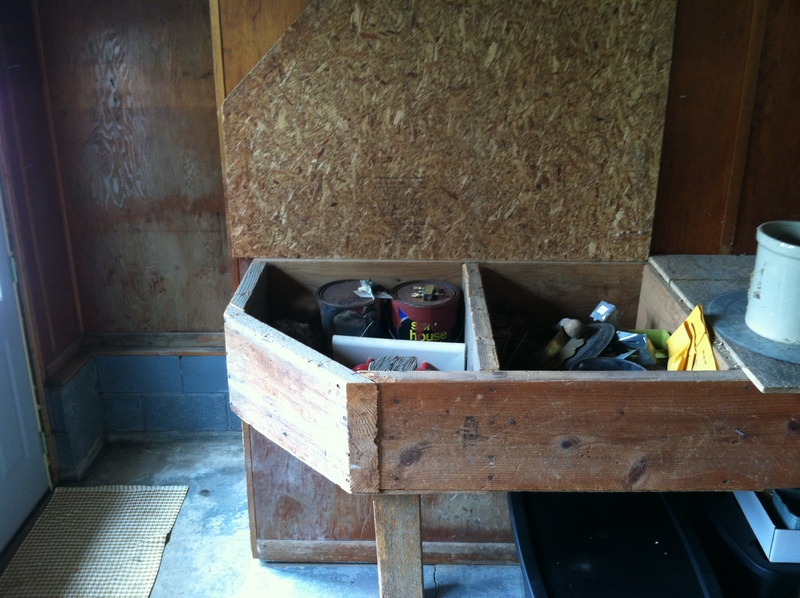 The previous owner built this funny work bench and paneled the walls in plywood. It was farm practical, but farm girl unapproved. 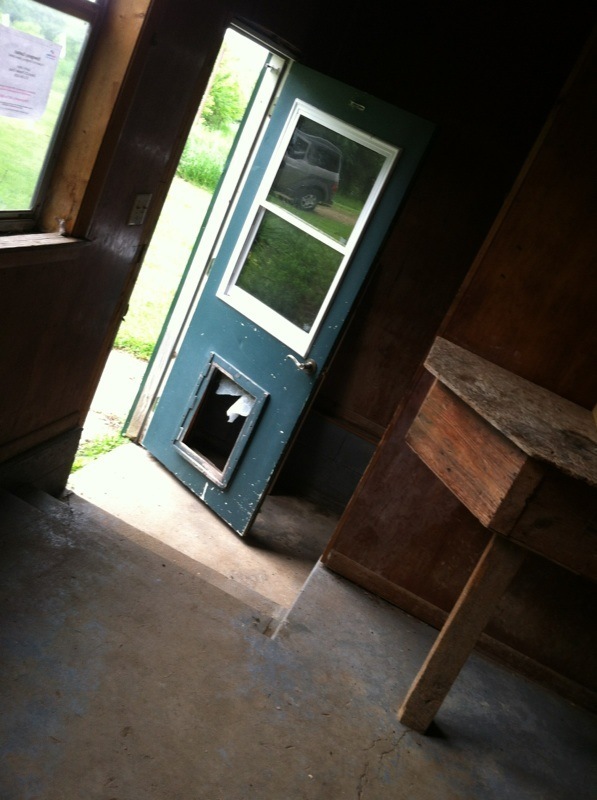 The grimy dog-scratched doors were gone last summer. We were thrilled to discover the upstairs bedroom doors were actually full-view double paned exterior doors, so we were able to use one of them for the kitchen entry off the porch…much prettier…still needs to be painted, but prettier! Clearly, this space was also used for the animals, so it had a subtle smell of wet dog and cat urine. Mice also travel through and occasionally don’t make it, so the bench boxes where they nested and died, smelled of mouse. I found some old junk when I was cleaning. Of course, I hoped to find the farmer’s buried treasure – perhaps a gold brick or at least a can of old coins, but instead I found old building materials, clothespins and a gun cleaning kit. Just what I was looking for. I did score an old pickle crock without a crack or scratch! Since the name of the makeover game was make do, I used what paint I had leftover from interior projects. After removing all the nails, screws and miscellaneous hooks, I primed the walls and white washed the old bench. The only floor choices available were turquoise or white, so I opted for blue seeing that this is a major entry often covered with mud. If it were just up to me, I would prefer the white. People think I am crazy when they see the white floors inside the house, but so far the color has worn well, and it is easy to wipe up if need be. I love the bright fresh feel of it. This below…not so much. 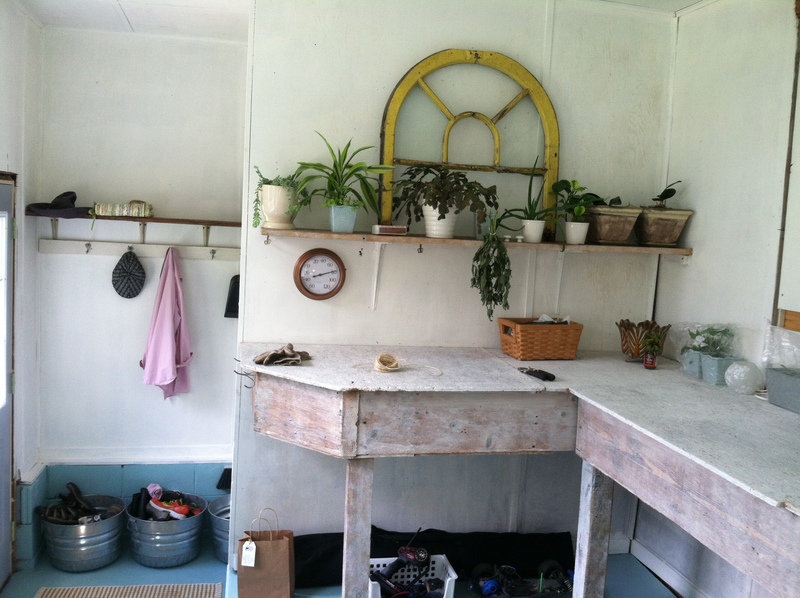 Now we have a lovely place to work with plants, hang our sun hats and prop our toys. We even have a place to rest our weary bones! – One of the joys of going to the Cities is to find thrift store treasures for the farm – $10 for the wicker at my favorite ARC Value Village! The upstairs bedrooms had all been trimmed out in a stained pine I referred to as “Cowboy Trim.” We replaced it with a milled trim to match the 1870s trim in the living room, but saved the cowboy pine for projects. Jeff made the wood boxes from that old trim to store logs, kindling and paper for winter fires. 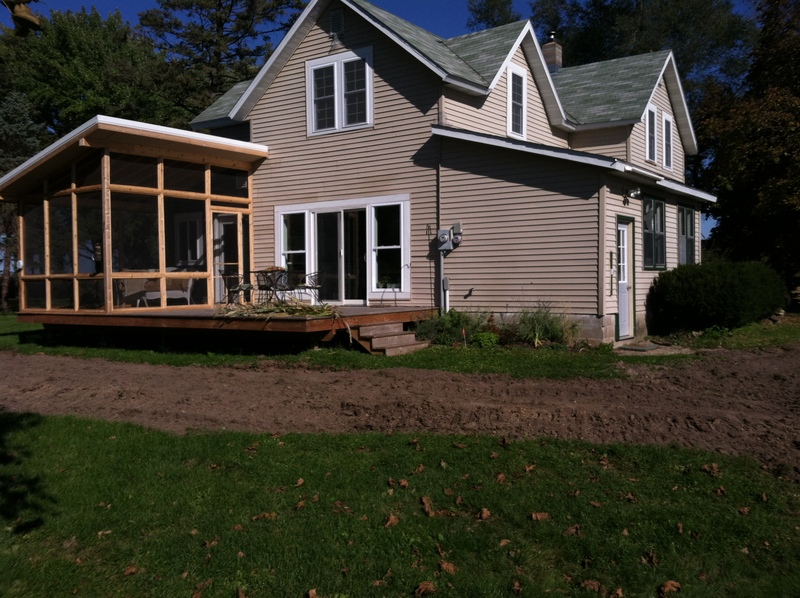 I like the “Make Do” porch so much, I may not be inclined to do the real remodel for quite some time! Up here in the North it’s strawberry season! And what a wonder to have a full “Strawberry” moon coincide with the Summer Solstice! According to Martha White’s recount of the Old Famer’s Almanac, “From full Moon through the last quarter, or the dark of the Moon, is the best time for killing weeds, thinning, pruning, mowing, cutting timber, and planting below-ground crops.” That means when I am not eating strawberries, I work on the annual “Burdock Eradication Program,” thin the carrots and beets and plant a few of each for good measure! Fruit trifles became a mainstay of farmhouse life last summer as the individual mason jar 1/2 pint servings are easy to store for a fancy dessert when company arrives. These I made with a gluten free granola crunched pie crust crumble that is AMAZING! It’s both delicious and easy to prepare. 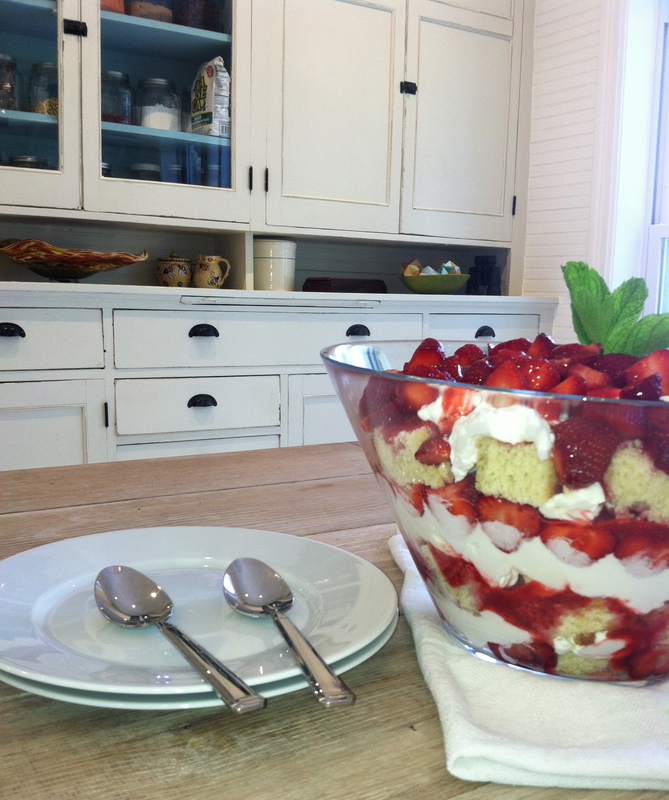 There are three components to this dessert: crunchy crumble, lemon minted cream cheese, and strawberries. Layer them together for a fresh and delicious summer dessert. The Strawberry Moon rose late last night and was just setting as I awoke at about 5:30 today. Directions: In a food processor, mix all of the ingredients except the whipping cream. You may need to push the cream off the sides of the bowl once or twice. Then add whipping cream and run processor until blended. Note: I’m not one for sweet desserts, so you may want to add more honey or sugar. 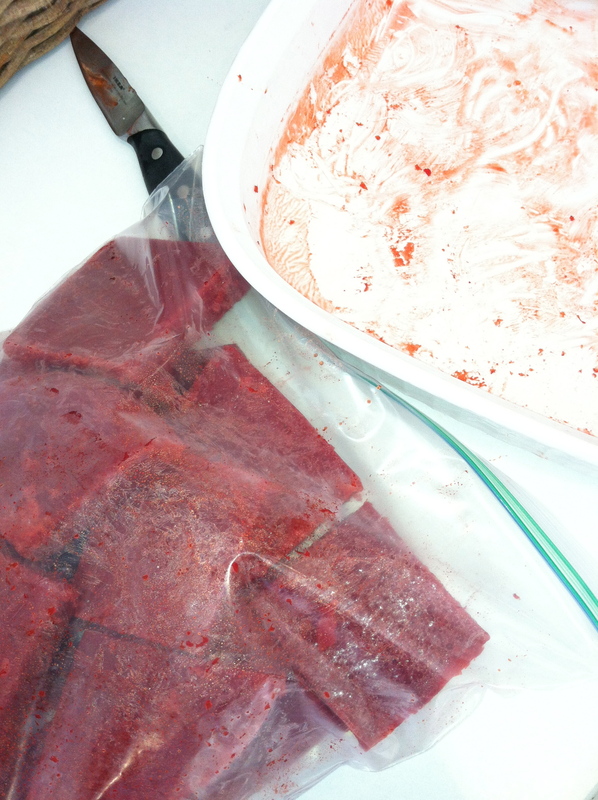 Strawberry Filling: Simply mix about a pound of strawberries with a tablespoon of sugar or honey. In this recipe, I pulsed the berries and honey in a food processor just until they were slightly chopped. Directions: Preheat oven to 325 degrees. Cut chilled butter into chunks. Mix dry ingredients. Combine the dry ingredients with the butter and vanilla until combined. Spread on parchment and bake for 30 minutes or until golden brown. When the crumble cools, you will want to break it into smaller pieces. My garden is still little. We had an early spring, but I got it in late. What do you make when you barely have lettuce, but the dill, mint and arugula are jammin’? You make a dressing, vinaigrette, or a dip sort of thingy, because the amount of ingredients needed is LITTLE, but the flavors are HUGE! Seriously, you need to make this – or something like this – it’s very jazzy, meaning you can riff on it all you want! You have herbs, make this stuff! 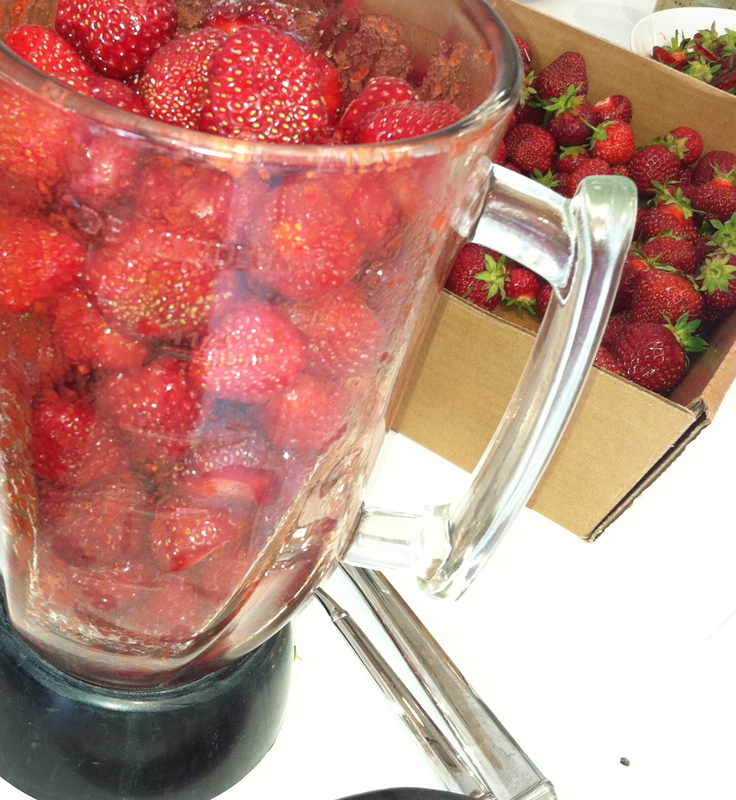 All you do is throw your junk in the blender, emulsify and enjoy. It’s the little things, the easy things, these things that make life so grand. What do you do with this stuff? It can be salad dressing, marinade, a topping for grilled anything, a pasta sauce a chip dip, or straight from the jar if you think it’s ice cream! I would say it’s better than ice cream, but probably has the same fat percentage…a total yum job, but with a few enzymes and vitamins to help stave off guilt! Yuerba Buena – the good mint! Now, I am going to make you really mad at this point, because I basically just threw it all in the blender with a dash of this and a splash of that. Remember, it’s Jazz. You can do it! My measurements are approximate because I didn’t measure anything, but I know, if you have confidence, your herb dip will turn out great! Directions: Place all the ingredients in the blender and pulse until blended. Then taste to see if you need a little more salt. (Hopefully, you don’t need less!) If it was hard to blend, add more oil. Look at the picture above until you get it to look like that – Jazz! I went traipsing through the property looking for tell-tale signs of Spring. Muck boots are an obvious give away as are snow-speckles dotting the grass, water dripping from the metal roof and puddles forming underneath the eaves. It’s such a wonder to me that we ever smile in a place like this let alone laugh or dance or celebrate. This land is sometimes so cold and unforgiving. Grays, whites, and browns dominate the landscape and are reflected in our wardrobes – gray jackets and black pants rarely meet up with a color more vibrant than navy blue or beige, yet many a Midwesterner can muster a joke and smile here and there. In photographs, Midwesterners force a toothy grin, yet Mother Nature says, “Be serene and calm and quiet in expression now.” Spring days like this remind us that we must practice patience and humility. Although, it appears our moles are quite unsettled and sophomoric! The only colors here are the occasional red of the highbush cranberry, the pig barn or the neighbors hay barn. If I am lucky, I will catch a glimpse of a male ring-necked pheasant dashing across the white snow, his red eye patches blinding bright red in a sea of white. A fleeting reminder of the debauchery and festivities to come when the riots of summer colors flood our senses. Above Lake Pepin, are BIG SKIES, big views and often high winds. Today, quiet gray serenity hangs low over the horizon and blocks out all remembrances of our summer spirit. Mother Nature holds her breath – the air does not move. Not even birds flutter about but instead wait quietly in their nests for the sun to dazzle us into sensual pleasures. Days like today remind us to sit and reflect and be still. But, in the driveway, I find one vestige of summer, of the party that will come; of the laughs and celebrations and smiles, of the life that will give food and festivity, the sign that spring is upon us and Mother Nature will grant us permission to walk not with serenity and peace and humility, but with boisterous celebration and bombastic glee! A daisy grows green today. 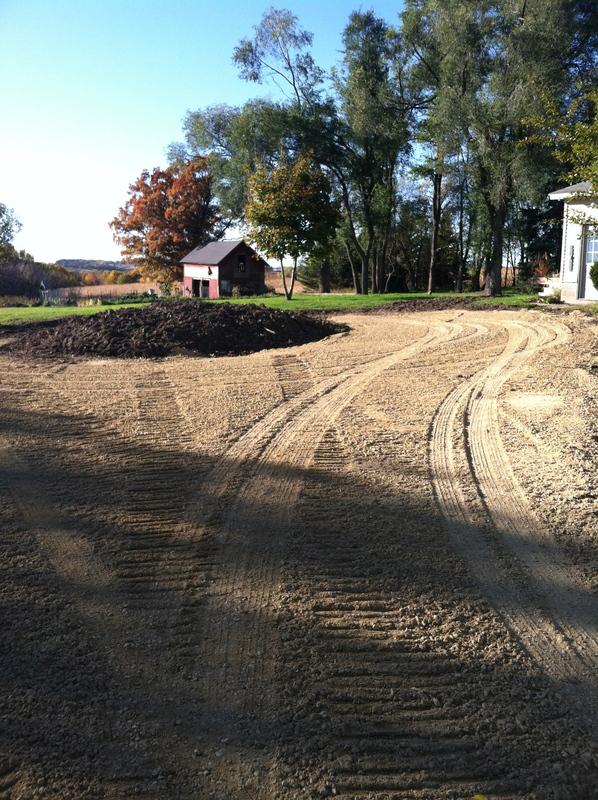 When this farm came on the market, we figured we’d do a drive by, but not likely buy it. For years we had been looking for country properties, but most of them were less than appealing once we got up close and personal. One property with the most amazing farmhouse and view of thousands of DNR wetlands had water in the basement up to the floor joists. It should have been classified as a wetland itself! Another property had a bedroom strewn with hundreds of guns and pond with a pink shell casing beach. Clearly full of shot and clay pigeon remains, we determined that pond to be poisoned. Asking a realtor to show these properties always seemed like a waste of time, so we learned most often to just drive by and check them out first. Occasionally, our interest would be peaked and we would enlist a realtor to show us around, but most often we were on our own. About five miles out from our Maiden Rock property, the rolling hills and expansive views began to pull at my heart strings, and by the time we were coming down the road in front of the farm, Jeff and I both found ourselves saying, “Oh oh! This could be good!” The site was spectacular and the farmhouse cute as cute could be. I went immediately to the house to find that the porch door was open. Inside the porch was a locked door to the main house, but an open window that went into the kitchen! I couldn’t resist, so climbed up onto the workbench and into the house. I opened the door for Jeff and within two minutes of walking around, knew we would buy it. Not only was the old farmhouse kitchen huge, but the master bedroom had two walk-in closets and it’s own bathroom! While entirely a mess and in need of some serious TLC, this was not your average farmhouse! So, we’ve owned the place for nearly three years now, and we just finished the kitchen last week. When we originally designed the space, I thought I wanted a bank of new cabinets and a bank of rebuilt old cabinets. We purchased a shaker design white cabinet from Lowe’s, and in contrast to the chalk-painted old cabinets, the new cabinets seemed a misfit. Immediately, I knew I would have to find old cabinets to replace the new, and it wasn’t until we bought our duplex that I found the perfect cabinets. Although, I think Jeff would disagree – all the rebuilding would cause him to argue that they weren’t quite perfect! This first picture is what the place looked like when I broke in through the window. Coming from the city and turn-of-the-century homes where small kitchens were tucked into the back of the house, this layout made my design ideas gush! This kitchen says, “We take food very seriously here!” It is the center of the house with a big heart and spectacular views. Yep, that’s the window fortuitously open for me to take a stealthy look inside and quickly fall in love! We removed the sink cabinets, centered the sliding door on that wall and added two large windows to either side of the slider to enhance the view and light. The above cabinet came out of a house in North Minneapolis that got a kitchen expansion. Yes, it is quarter sawn oak, and yes, I painted it unapologetically. Notice the two flour bins. We use these for garbage and recycling. The window I broke into was removed to make space for two new windows that would allow even more light to fill the room with southern exposure. The photo below shows the Lowe’s new cabinets and a slide in range we scored from Craigslist. Someday I will have a signature range of some sort, but in the meantime, this Maytag stove was really cheap and nearly brand new. The farmhouse runs on electric with solar in our future plans. You might be surprised that I can cook on electric! This stove made the transition quite easy, actually. And, the solid glass top is so easy to clean up – I love that feature! The farmhouse kitchen originally had included not only the kitchen, but dining room, bathroom and back entry. So, once we removed the linoleum, we knew much of the floor would need to be removed and new flooring laid to remove the gaps where the walls for these rooms had once been. The picture above shows the dark original floor boards and the new lighter flooring primed and ready to paint. That brings us to last month. We were finally ready to begin installation of the new old cabinets that Jeff had pulled from the duplex and rebuilt. The white Lowe’s cabinets were removed allowing me to fill in the last of the little holes whose warm puffs of heated air invited mice into the kitchen! Much of the new old cabinets had to be resized and rebuilt to fit in this location. Jeff cut down one of the door cabinets making each of the doors smaller to fit this space, and had to build new cabinet boxes and a panelled end side. The old parts that remain are the doors, the drawer frame and the drawers. 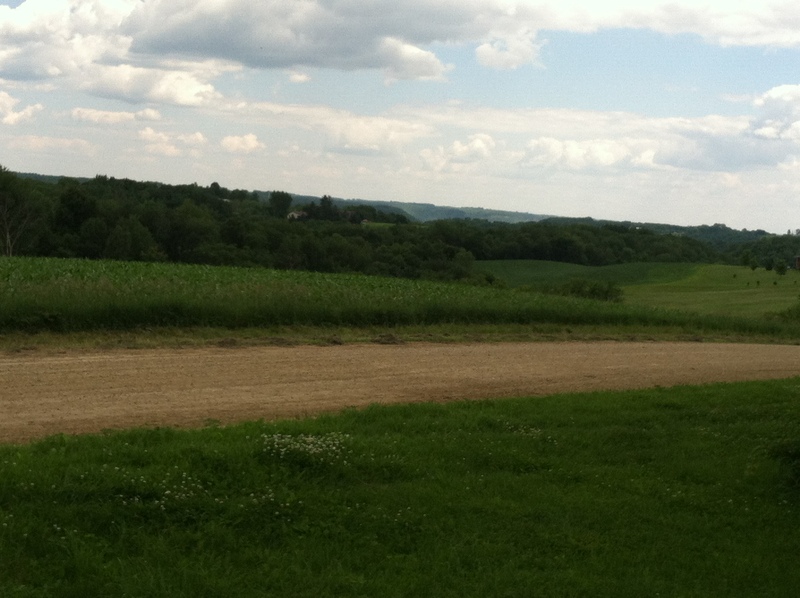 We celebrate the fact that our farm is above the Great Mississippi Flyway called Lake Pepin. This area lies in the “Driftless” area of Wisconsin forgotten by the glaciers and left with rolling hills and deep ravines. We designed the place to celebrate the water with a “Farmhouse Coastal” theme. 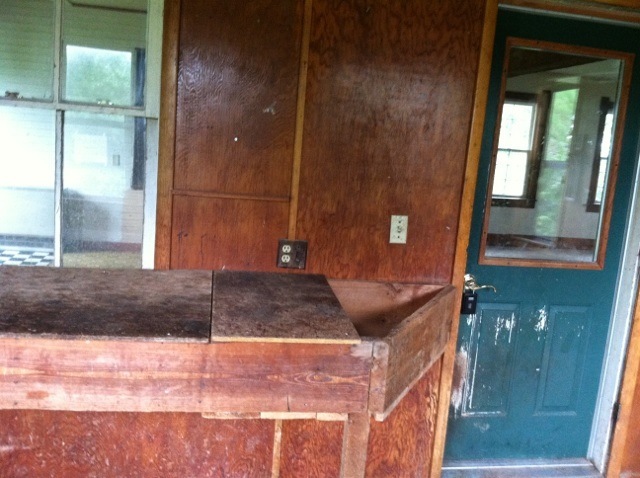 For the last three years what we would do for a counter top was a great unknown. Many years ago, Jeff scored some beautiful marble from a rehab job at an old St. Paul fire station. The marble found a home as the wood stove hearth, counter tops for the old cabinet in the kitchen and a radiator cover in the living room. It was free and a perfect color for the farm. We priced out granite for the kitchen, but when the nearly $4,000 quote came back, I knew we would have to get creative. So, in the meantime, Jeff screwed the old refrigerator side panel to the top of the cabinets as a temporary counter top. It worked great! The old new cabinets got the same chalk-paint treatment as the other two, but this time I used a white wax making the “Pale Lichen” just a little creamier. We decided on stainless hinges and handles on this side of the kitchen to compliment the appliances and dishwasher. Now that the new old cabinets are in, I am feeling a bit more irritated with the white stove, but that will have to wait for a later date. I suspect I will search for a similar model, but in stainless. Although, I love the Northstar reproduction range in Robin’s Egg Blue! We found a counter top! Rummaging around at one of our favorite Building Materials Outlet spots, we found some quartz counters for $300. Since the price would allow for error, Jeff decided to take on the challenge of learning to cut and polish this stuff himself. I am so proud of him! He cut out the sink bowl, buffed the edge to a shine, glued a small piece on the wall end to get the correct length and secured the backsplash. In our other renovations, counter top cutting and installation was a task we would contract out, but not any more! The color exchange between the cabinets and counter is a little more monochromatic than ideal, but for the price, it’s perfect! Remember the cheese grater light shades! I love the open shelving as well – a place to highlight our color scheme and a few favorite pieces. We got this old Kitchenaid fridge off Craigslist as well. It came with white bevelled panelling that we replaced with “barnwood” made from cedar fencing and stained with “Sunbleached” gray Varathane. It’s so tempting to go all “farm” theme with lots of weathered barnwood, but I tried to temper these peices to just a few. Our stove hood and fridge are covered with faux barnwood, and we have the old beam between the kitchen and living room. 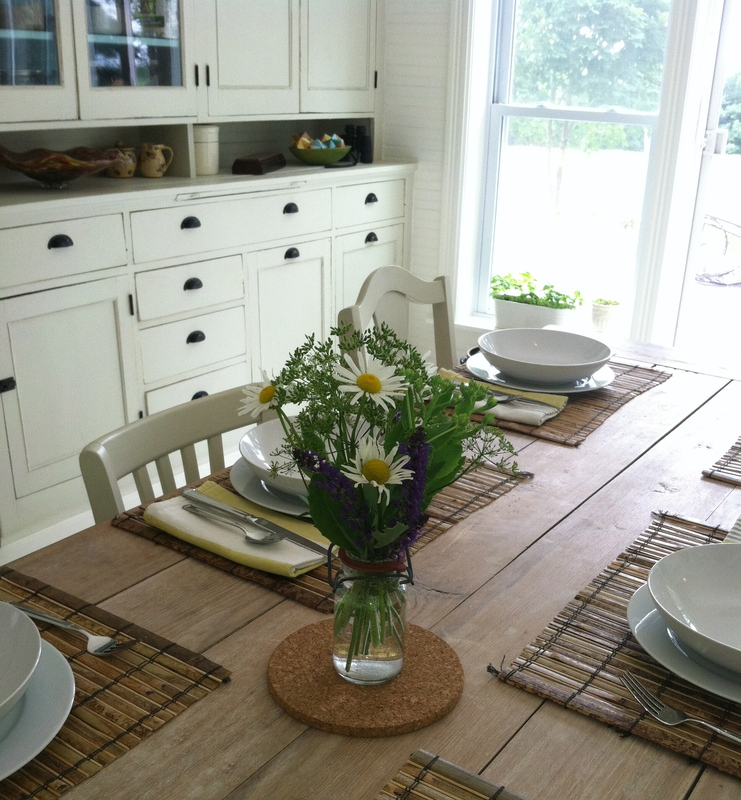 Of course, the signature farmhouse table stands as a stalwart symbol of the weathered barnwood look! The darker cabinet on the left was original to the house but had hung on the wall near the sink. This was painted with the “Pale Lichen” chalk paint and finished with a dark wax. The cabinet to the right is the old quarter sawn oak cabinet with the same color chalk paint as the smaller cabinet, but finished in clear wax. All hardware is original on both cabinets. What a view! And, we certainly managed to fill up the space. Someday I will get a real camera so the pictures can be better quality. Jeff built this table from a hand milled oak tree my parents gave him when they discovered he had a taste for wood-working. I love how he designed the legs to look so chunky. The thing weighs a literal ton! Remember, this is what the kitchen looked like before we started digging in! Now we have a kitchen that takes its farm lunch very seriously! Skinny is EASY – Crazy – but easy. Skinny in 30 EASY steps. Get rid of any food in your house that is not a fruit or vegetable. Well, actually, get rid of potatoes, tomatoes and peppers, too. Make a big bottle of salad dressing with vinegar, olive oil, raw honey and a titch of salt. Buy a juicer and blender if you don’t already have these. Grocery shop only in the produce section. You can eat any and as many fruits and vegetables as you like except potatoes. Well, actually, you might want a few seeds, a bit of tofu or some chickpeas, too. You can have coffee and tea. Smooth Move tea is great for skinny. In the morning make a quart of smoothie with spinach, pineapple and lots of berries to sip throughout the morning and early afternoon. This becomes a meal replacement for both breakfast and lunch. Throw in some flax if you want. OR Make a quart of juice with cukes, apple, lemon, kale and ginger. Drink this on ice for breakfast and lunch. Snack on an apple or a few almonds if you are hungry after your sip-all-day breakfast and lunch. Make a HUGE salad for dinner with greens, tofu, sliced pear and nuts. If friends want to go out for dinner, invite them over for salad and tea instead. If you get hungry at 6:30, go to bed. Don’t forget to power walk at least three miles while watching the Walking Dead – Zombies are good for the stay skinny diet! I guess that means you better buy a treadmill, have access to NetFlix and have a TV or iPad to watch. During the holidays to stay away from decadent treats. It helps to book a condo in some other country to get away. Make sure the condo has a blender and access to vegetable market. Don’t buy a farm in the Midwest where a big farm table will beg for carbohydrate laden decadent farm meals. And don’t even think about adding a wood-burning pizza oven to your backyard. Food blogging isn’t a good habit for those who want to stay skinny, and reading blogs about food just makes me hungry. Make sure you have a job that keeps you busy enough for most of the day, so you don’t have time to think about food. Choose a job that also keeps you away from food. Follow the 5/2 plan: 5 days of clean nutrifeasting (my term for eat as much as you want of these vitamin rich foods) and the weekend is yours to eat what you want. Weigh yourself every morning to monitor. Never consume more than 1000 calories a day if you want to lose weight. Always wear comfortable clothes in case you get the chance to sneak in a Warrior Two or Down Dog. Well, actually, wear skin tight clothes, so if you gain any weight, you know immediately. Stay hydrated with lemon water. Read Michael Pollan’s book, In Defense of Food. Absurd, isn’t it? But think about what happens if you don’t do these things. We have access to the most nutrient-dense foods on the planet 24-7, and many of us have addicted brains. Once I enjoy a french fry, salty chip or cookie, I can’t stop eating. And, typically there is no shortage of the desired foods. Portions are huge everywhere. I can’t seem to manage an “Everything in Moderation” attitude if I truly want to feel great and keep my weight down. I have found that to maintain a healthy body and weight, I simply cannot be around most “American” foods. I do not have the will-power. But, when I eat only smoothies, juice and salads, I feel energized, satiated, happy and proud of myself. My body does not get splotchy or tingly or lumpy or frumpy. I feel right. So, although these 30 steps may seem ridiculous, they are what works for me. NOTE: I haven’t actually made anyone move out of the house, but I tend to avoid the dining room and kitchen when others are preparing or eating their food. What a beautiful day! It was warm enough to work outside and decorate for the wintery season that will soon arrive, as well as enjoy some of the lasting flowers in the garden. This time of year in Minnesota and Wisconsin we go from warm and balmy to shoveling a foot of snow overnight. Northerners get to have a summer bouquet grace the table, and evergreen bough urns stand guard on the deck all while pumpkins and falling leaves still linger. For a few brief moments, the seasons nearly juxtapose. Of course, it is all we can talk about, too! Wild grapevine with spruce, fir, cedar, arborvitae, wheat, grass and sedum. Not only are many flowers still in lazy bloom, but my lazy girl garden is still laughing at me in hysteria! All summer long, I strolled the gardens with nary a weed pluck here and a little scatter mulch there. I ambled around picking a few of this and that for whatever I desired to cook, and hosted a few “garden walks” toting wine and garden appetizers. The summer was languid and luxurious, but as soon as September rolled around it was as if Medusa were out to get me. The joke’s on me! My days touring guests through the bountiful Victory Garden or imagining I was the host of some fabulous “Farm to Table” venue came to an abrupt stop as piles of tomatillos dropped to the ground begging to be gathered, pole beans began popping out of their shells as they dried and I couldn’t find enough people excited about ground cherries, beets, or cayenne peppers to relieve the pressure. The crazy bounty really began to mess with my OCD! Cold weather looming demands the harvest brought in and the junk cleaned up. But, there just wasn’t enough time each weekend, and the “To Do” list kept getting longer. 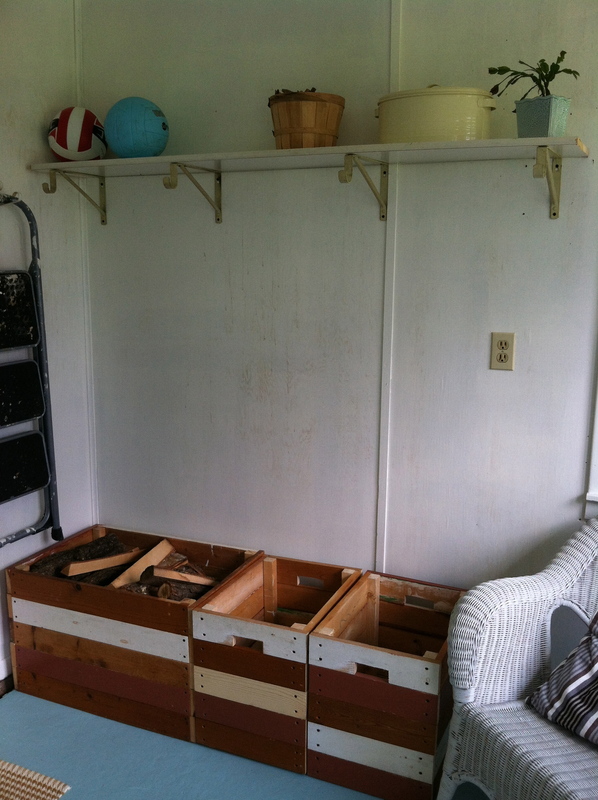 Furiously, I picked and put – into jars, pots, freezer bags, and neighbor’s porches! I even brought veg to the classroom to send home with students. They easily removed from my life over two hundred pounds of tomatoes, at least a bushel of ground cherries, not enough tomatillos and hot peppers to spice the lives of twenty-nine families! Thanks be! The garden foliage removal has been the most beastly. You’d think yanking out old plants would be easy, but for some reason they grab and hold the earth not wanting to give up their reproductive tasks – go figure! 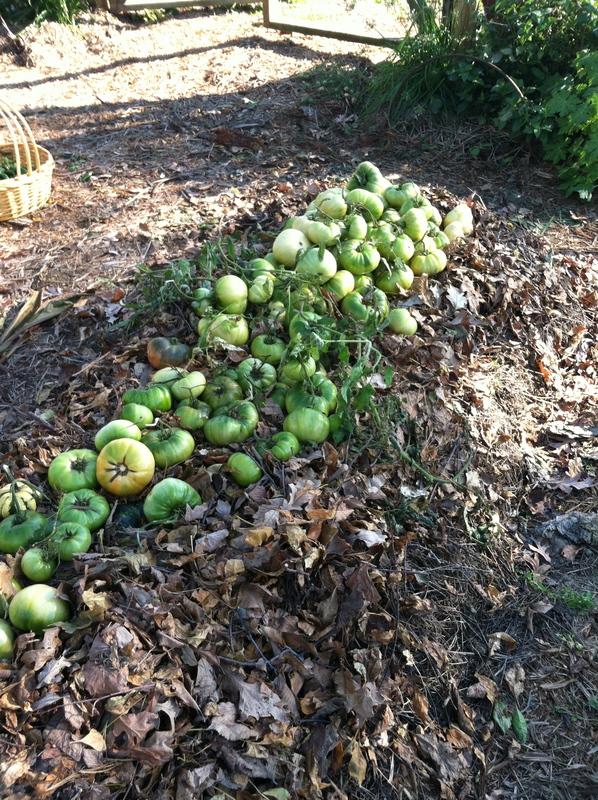 To clean up ten tomatillo plants easily takes three hours and a strong back ache to follow. Load after load of garden debris added to the compost pile with no machinery to turn it really makes you wonder what in the heck you’re doing. This is clearly how NOT to build a compost pile! To think part of my Peace Corps expertise was compost building! The country will always win! Mother Nature leaves you city folks alone much of the time, but out here, she holds a powerful wrath! Obviously, I am smuggly blogging today feeling quite certain that my duties to the garden Medusa have been satisfied. Back to lazy girl gardening! Where to begin! 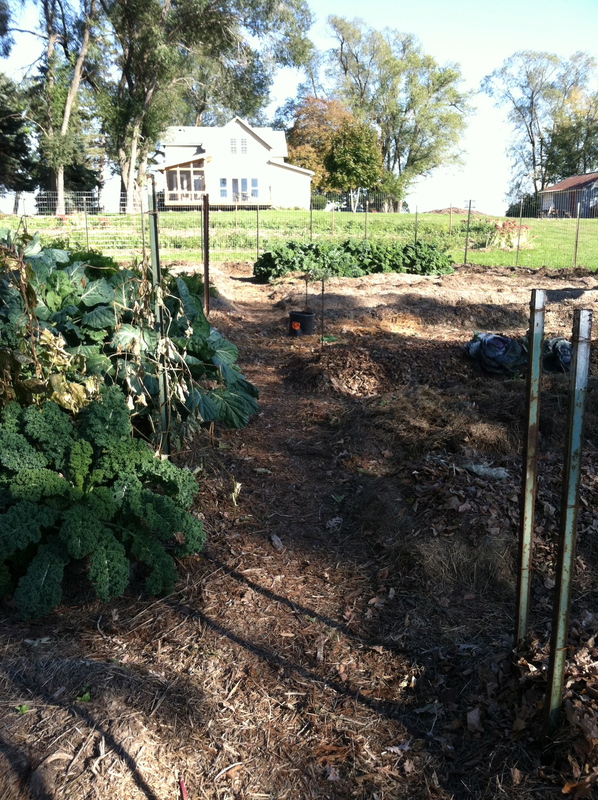 The vegetable garden was my pride and joy this year, so the first killing frost was a sad day for me. Even though, there is something so wonderful about putting much of it to bed. The opportunity to really shine the light on what is left is incredible. 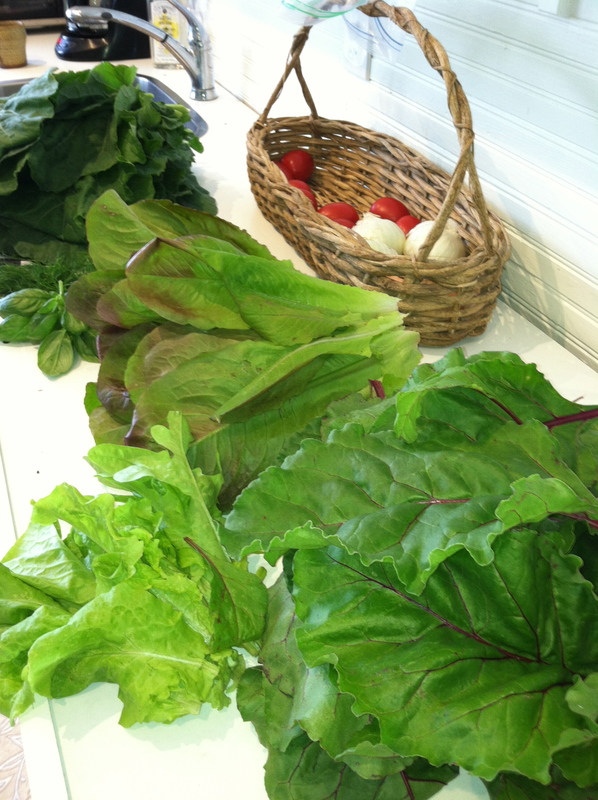 The kale, Swiss chard, cabbage and many herbs are still in full form, so food from the kitchen is plentiful. Our Brussels sprouts gave us nothing but gigantic leaves this year…oh well. Yesterday I planted four beds of garlic – over 250 bulbs! Last year we planted 80 and only 40 survived. I realized with all the salsa and sauce making, I need way more garlic. Ours from this year was gone by August. This bed of tomatoes has been taken into storage and they are ripening faster than I can give them away – the last of the yellows. 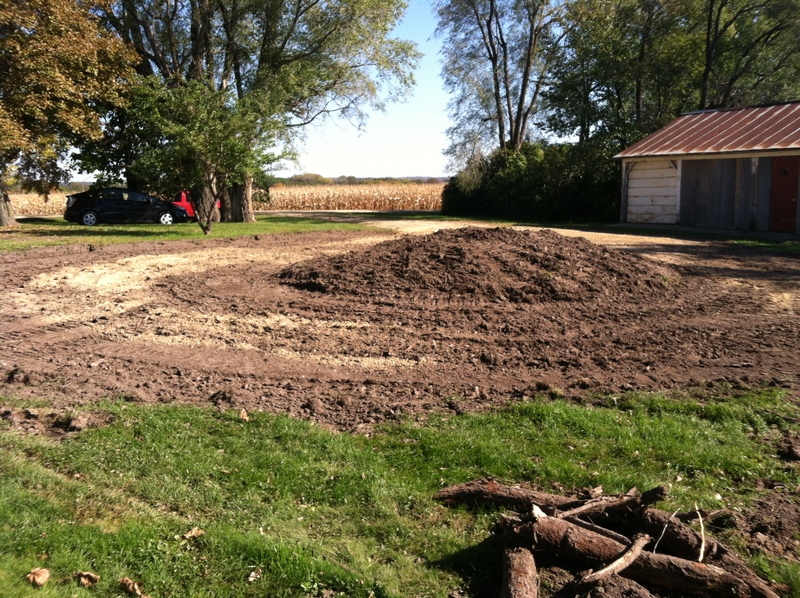 So, besides putting the veggies to bed, we have been busy, with the help of a neighbor and his machinery, building a circle drive with center berm garden. Jeff is working to lay a limestone barrier around the edge, and we actually have much of it planted, but not all the gravel is in. I’ll have to post pictures next weekend of a more finished project. We’ve also been building a perennial garden around the deck, and Jeff and Max laid a new concrete sidewalk between drive and back door. It was a big weekend of work! 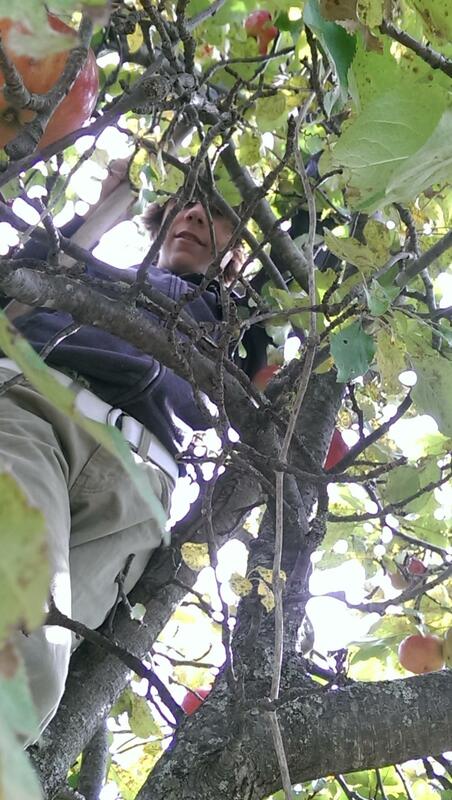 We did have a little fun with the neighbors picking apples and making cider! 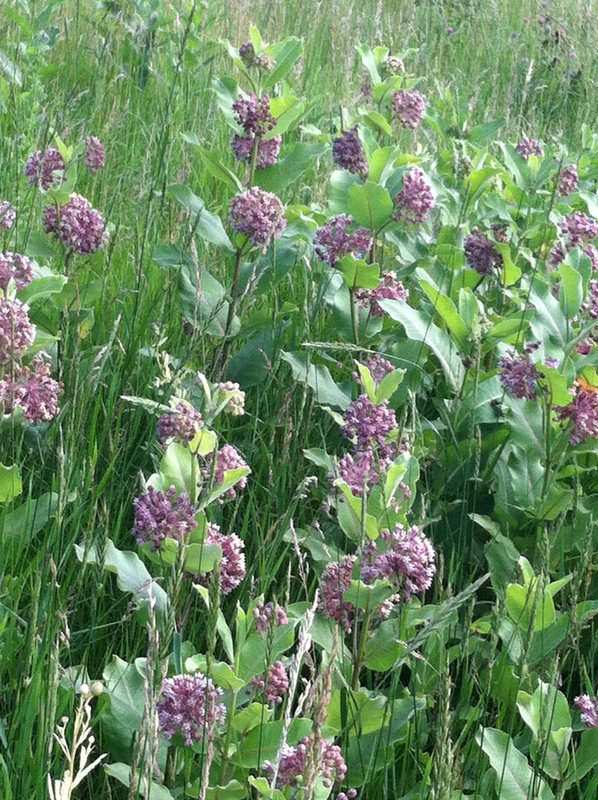 Native Wildflower Nutritious Bee Forage Needed! I’ve got a bee in my bonnet. As this idiomatic expression is defined by the Cambridge on-line dictionary, it means to continue to talk about something you think is very important even when others do not. Ha! I can tell you are laughing! Oh, she finally realized how irritating she is constantly talking about vegetarian recipes, juice and salad! You’re thinking I’m going to lay off and leave you alone for awhile? Maybe start posting about how to make marshmallows or some other confection using high fructose corn syrup, or bring you a mouth-watering line-up of fried fair-food on a stick? No. I’m off food for the moment, and am now perseverating over bee forage gardening. I’ve just got to tell you about it because I think you can help. So, in June the United Stated Department of Agriculture (USDA) offered a program that will provide $8 million dollars as an incentive for farmers to set aside land that had been commercially grown, and instead, establish honeybee habitats. This money is designated for the five states where half, that’s right, HALF of the commercial US bee population resides in the summer months – you guessed it, Minnesota is one of them as well as Wisconsin, Michigan and the Dakotas. In February of this same year, the USDA designated $3 million dollars to support bee populations through conservation and environmental quality programs that involve setting aside 100,000 acres to grow native wild-flowers. I got wind of these programs through my dad sending me USDA links, and it got me thinking. As a city slicker, I would not have likely noticed this news. As a foodie, I would have been a little curious, and perhaps developed a narcissistic worry over where my next plate might come from if the bee disappears, but now as a beekeeper myself, I see the need to act. I’m freakin’ out! Sometimes, environmental news seems so overwhelmingly sad – it is – but, in the case of the bee, I am hoping there is something quite simple and beautiful that we can all do. We can plant gardens! We can plant gardens full of bee-friendly flowers (without neonicotinoid-laden pesticides, of course) that will provide nutritious forage for our most important friends. The views at my farm are lovely, but after reading the news of late regarding bees, I see my property in a whole new light. Do you notice what’s missing? Sure there’s a bit of clover, a few flowers I planted, but in general, there’s a lot of open space that could become wildflower bee habitat. We do have a bit of meadow with wildflowers like milkweed, daisy and yarrow that provides forage for bees and butterflies, and I also planted a large circle of black sunflower that will look crazy-cool in a couple of weeks. But, because the previous owners had animals, the burdock and thistle were thick and choking out nearly everything else. We decided to keep a large portion of the property mowed this year in order to cull those two particular species. As we have cleared the land, we have planted three varieties of clover as well as annual rye to give quick cover to the soil. But now I see that this is not enough. So, I have been reading like crazy trying to figure out what flowers bees will like and what I can grow on the property. 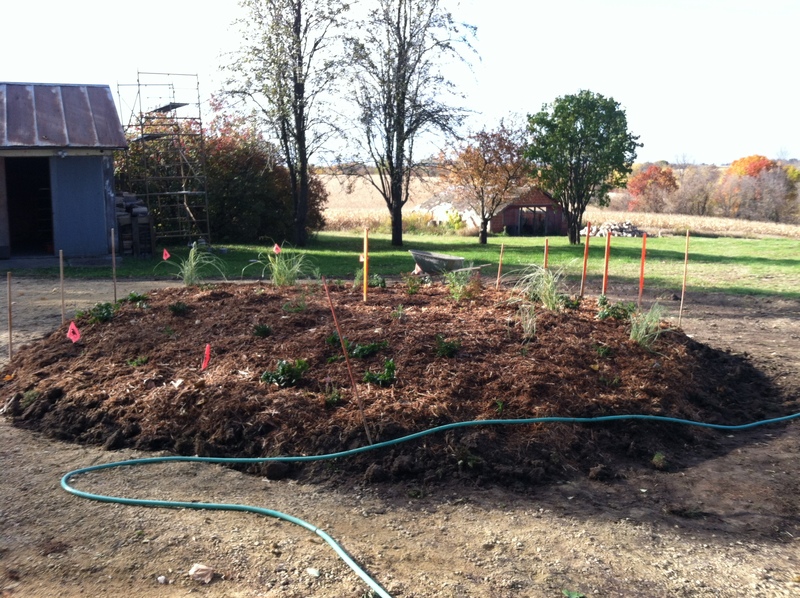 The USDA program suggests that the planting include a mix of annuals, perennials and sometimes native grasses. 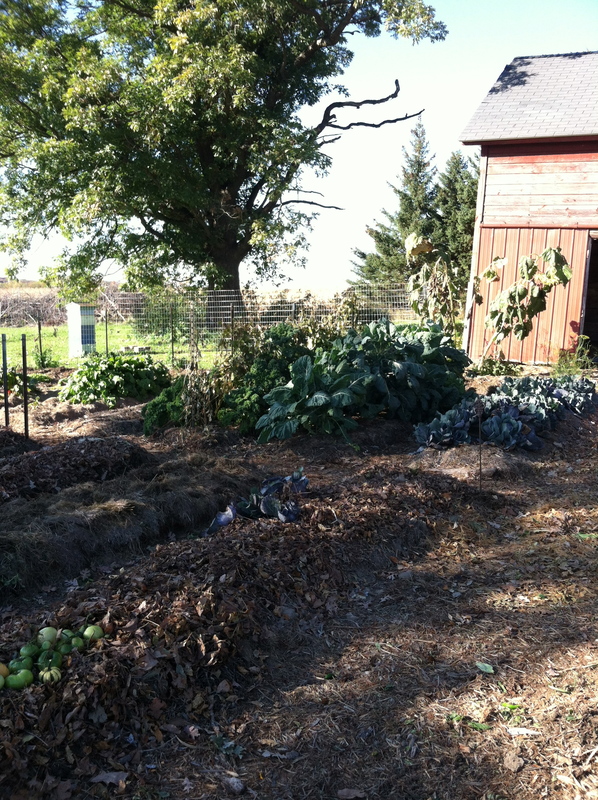 They also suggest planting in large swaths or patches at least 20 square feet. Below is a very large patch of Phacelia I found planted at a neighbors blueberry farm specifically placed for bumblebee forage. Apparently, it is the bumblebee who is the main pollinator for blueberries. I had never seen this annual before. It has a really beautiful blue to purple flower and when planted in mass it is quite stunning. The picture below shows Phacelia about two weeks after its prime. 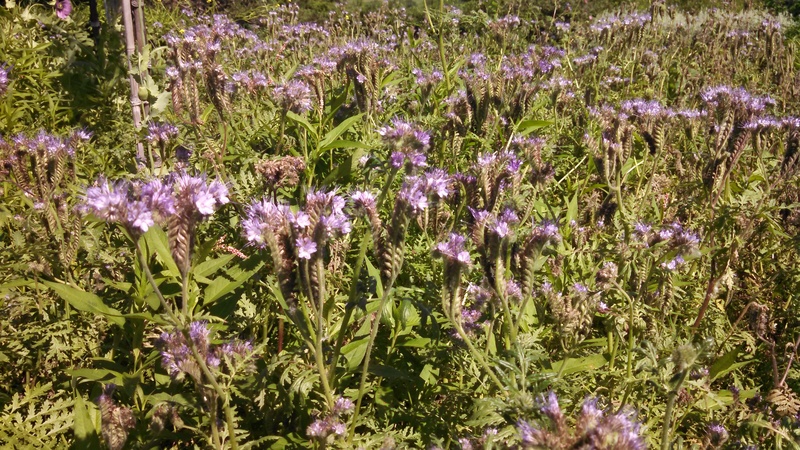 It also turns out that Phacelia can be used as a cover crop. Cover crops are used to add organic matter, aerate, protect soil from erosion or to provide or absorb specific nutrients. It turns out that Phacelia is good at absorbing extra nitrogen and calcium. That seems a good thing for a blueberry farmer who wants to keep lime levels low for the correct blueberry ph. I found this field of poppies at another farm near me, and these flowers were full of happy bees. In reading about bee-friendly flowers, I learned that bees go to poppies for their pollen to feed the babies rather than for nectar for honey. 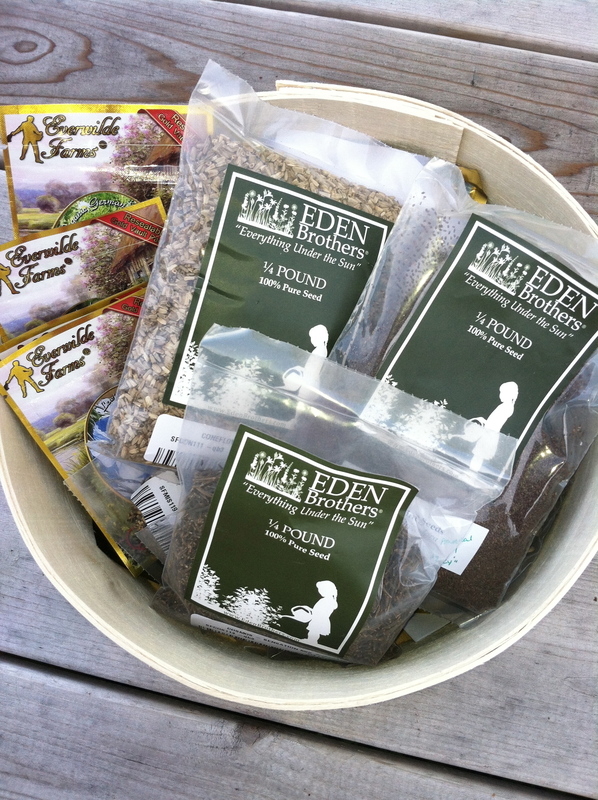 I also learned from visiting with the neighbor that her seed comes from the grocery – how convenient! 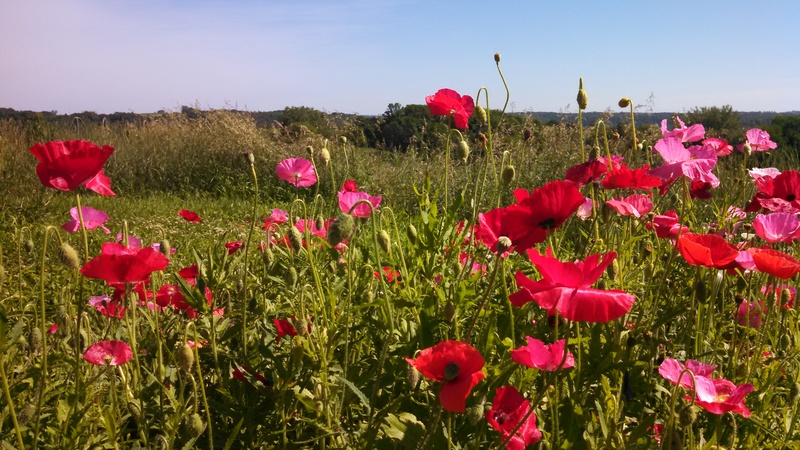 The poppy seeds we buy for lemon poppy-seed muffins can also be grown for bee forage! So cool. I’ve not had much luck with poppies in my city gardens, but I haven’t given it much effort. Growing with Plants has great step-by-step instructions for planting poppies if you want to give it a try. They are so stunning in mass and even lovelier in a bouquet on the table! So, here’s what I propose to do. I bought a bunch of bee-friendly flower seeds from companies that would not have seeds exposed to neonicotinoids, and plan to plant in large circular swaths. I bought large quantities of Lupin, Echinacea, Cosmos, Chicory, Wallflower and Black-Eyed Susans in addition to a smattering of other bee-happy plants like Betony, Flax, Daisy, Wild Indigo, Hyssop and Aster. I’m excited to create a visually stunning landscape over the next couple years, and add to a friendlier bee habitat. In the city, our entire yard is perennial plantings, and plan to add a few more patches of Black-Eyed Susan, Poppies and LOTS of Monarda. It seems to me that no matter how much land we have, we will all enjoy the benefits of building for the bees. Join me won’t you, to put a bee in everyone’s bonnet! 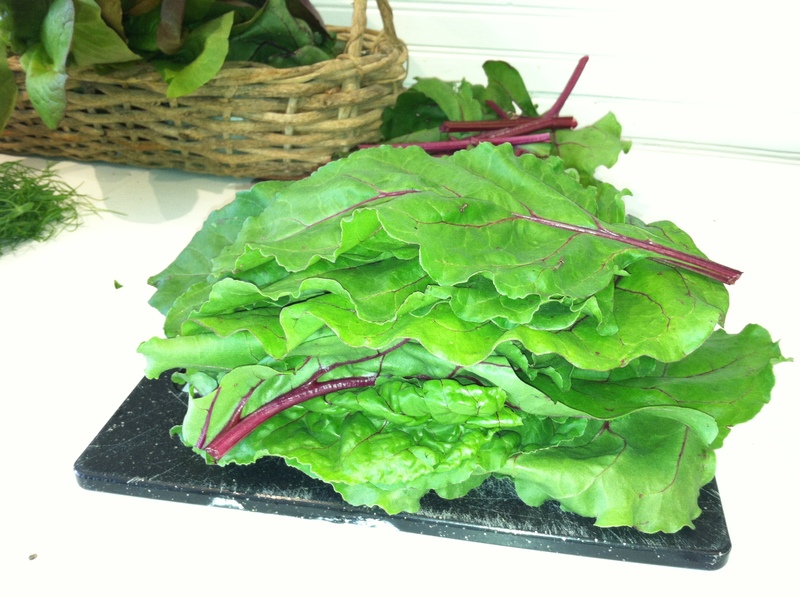 And An Herbed Beet Greens And Butter Lettuce Salad Was Born! 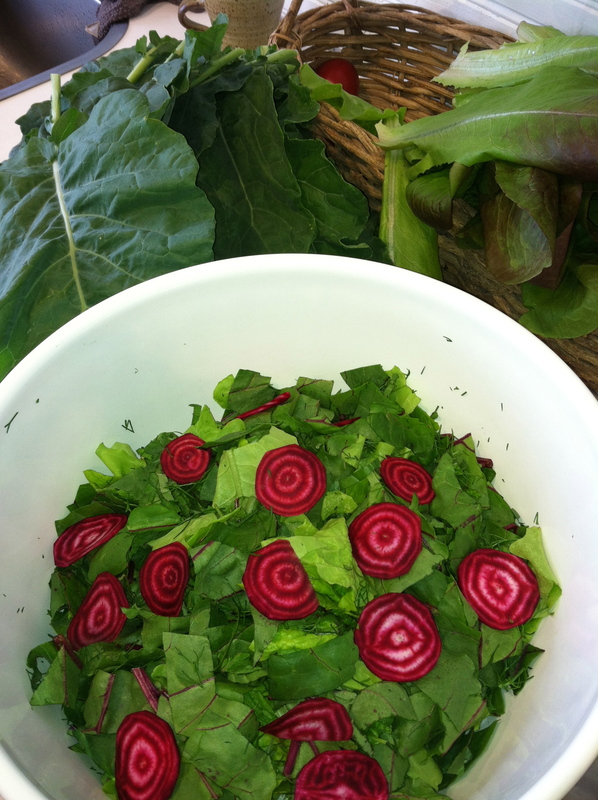 If you’re getting a CSA or shopping the farmer’s markets, look for healthy and perky leaves on your beets for a double whammy as beet greens make fabulous salad. They have a wonderful, rich, mellow flavor, and their tender leaf makes for a nice crisp salad chew! I chopped the greens and thinly sliced one beet for a quick salad, but should experiment with the tearing method as the greens may have a better aesthetic that way. Aesthetics aside, the flavors in this salad were quite complex and enjoyable. One of my weekend menus called for Farm Fresh Spring Rolls that were to include rice noodles, beet greens, butter lettuce, mint, basil, fennel and dill, but I ran into a bit of a materials snafu and had to alter the course. Before I discovered my missing ingredient (forgotten spring roll wraps), I made a spicy sesame ginger dressing which ended up topping the beet greens and spring roll herbs in a wonderful accident. Toasted sesame oil pairs well with the buttery nature of beet greens and the ginger-garlic-spice made for an interesting and delicious surprise flavor. Here’s an approximate recipe for the dressing. You will want to taste and adjust especially the soy sauce. I don’t like the dressing too salty, so find that I add the aminos slowly. This salad was followed by a simple collard stir fry with ginger and garlic, spicy tofu and jasmine rice. 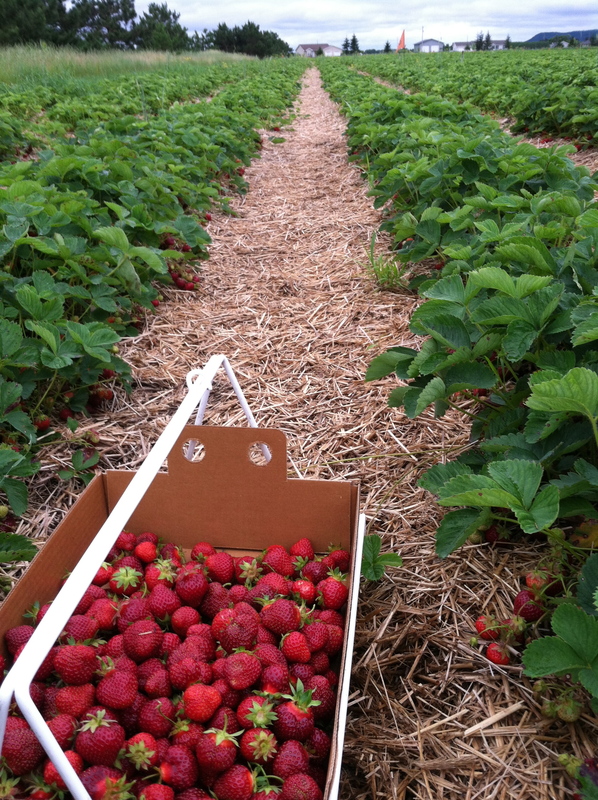 If you are a fool, you’ll drive Highway 10 east out of St. Paul in order to get to Sam’s Produce to pick your own strawberries, peas and other yummies in a little less than 90 minutes. If you’re smart, you’ll make a day of it. Drive Wisconsin’s Great River Road 35 through some of the prettiest scenery and charming river towns. You’ll stop at the Smiling Pelican Bakeshop for THE MOST outstanding baked goods ever, check out some art in one of the Stockholm galleries, think about Christmas shopping for some interesting linens and kitchen goodies at The Palate Gourmet Kitchen Store then have lunch at the Harborview Cafe in Pepin. Only then will you amble north on N or any other variation of back roads you can find to slowly take you to Sam’s outside Arkansaw, Wisconsin. Don’t be a fool and forget a cooler with a bit of ice, because you may want to take the same route home! A smartphone is also quite necessary for mapping purposes! Of course, getting lost could be fun if you’re up for adventure! Do make sure Sam’s is open for afternoon picking, or you’ll have to reverse the order of my suggested itinerary! I rode out to Sam’s for strawberries with a neighbor from the area, Terry Cuddy. She hails from Rush River Produce (watch the video!) and runs a FABULOUS u-pick blueberry farm. (Plan another trip for blueberries beginning the third or fourth week in July or anytime through the beginning of September.) Knowing the area well, she meandered us around farm country north of Maiden Rock, through Plum City and down a few “Sleepy Hallow” gravel roads – wow! What amazing scenery! After today’s adventure, my To Do list now reads, “Take a Drive.” I’d love to get to the point where I “know the roads.” There are lots of 450th, 670th, 220th streets and avenues along with highways called N, P and D…it’s confusing for the city slickers! What a treat it was to not only see the scenery, but to sit in a row chock-full of perfectly red luscious berries. There is nothing better than a straight-from-the-vine freshly picked fruit. In my opinion, many commercial berries have lost that intense strawberry flavor. They seem to have a more intense sweetness, but less of that tart strawberry rush. The variety we picked at Sam’s was a smallish berry, not too sweet, but with highly concentrated flavor. 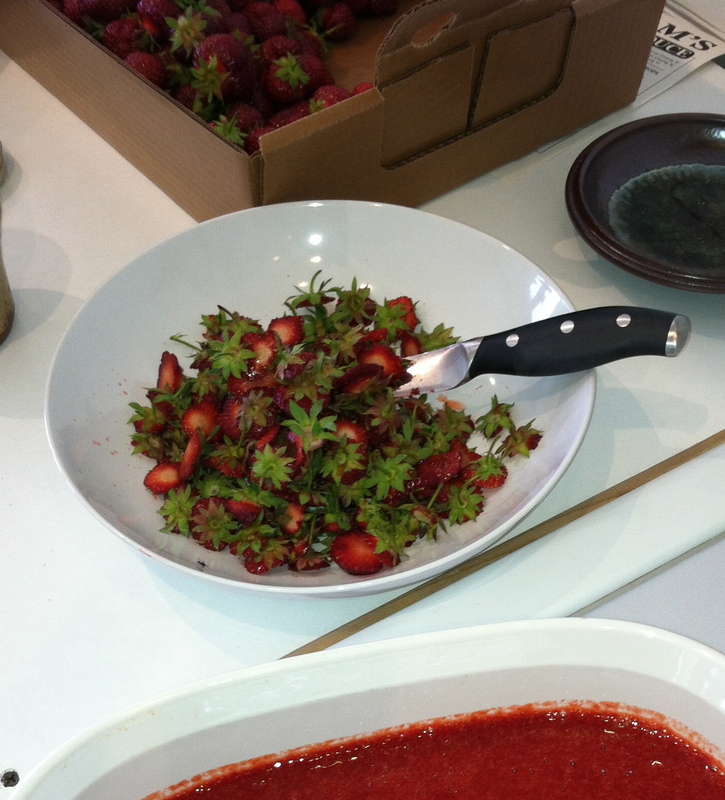 In addition to being a bit less sweet than commercially grown strawberries, Sam’s berry was noticeably juicy. I suspect they were plump from all the rain we’ve experienced lately. These incredibly juicy berries ended up in Romtopf, smoothie-ready frozen cubes, sauce with honey, and some were left whole and fresh for this weekend’s strawberry shortcake. 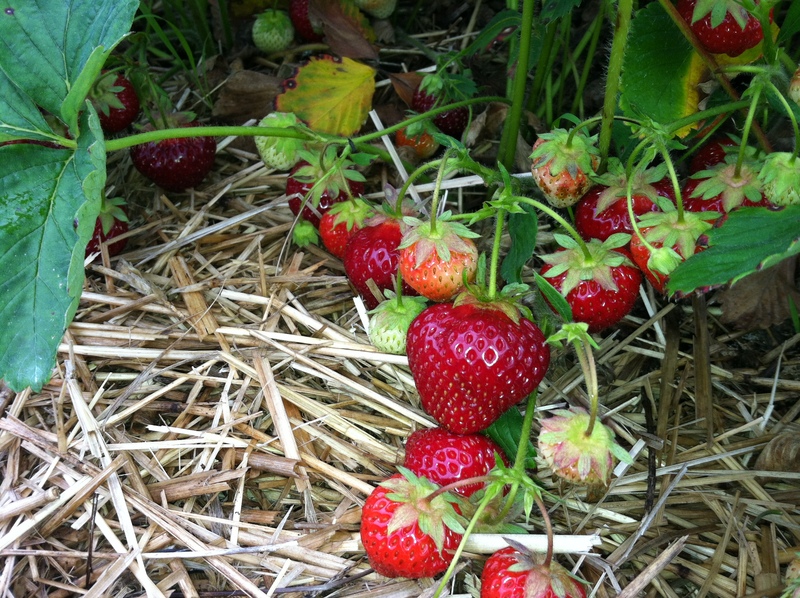 Sitting in a field picking berries gives you time to think about the “farm to table” concept. While picking in Sam’s Produce fields, I thought about how Dan and Tammy and their kids prepare the soil, plant the berries, mulch them in the fall, uncover them in spring, worry about rain and pests and getting the berries picked. In the city it is so easy to take food for granted, so it seems valuable to experience the field if even for a moment! 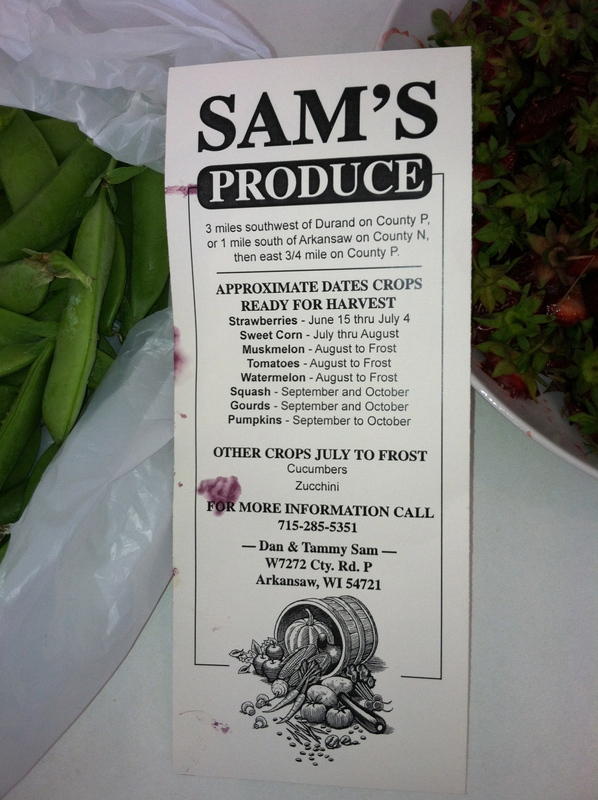 You can get updates on Sam’s Facebook Page, find info about their farm and products at Savor Wisconsin or call them personally for specifics at 715-285-5351. I’m excited to make many trips to their farm this summer – think pickles!